Chapped lips are no fun so we've made a lip loving formula just for you. 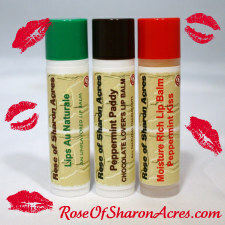 These balms moisturizes without all the extra 'stuff' that many over the counter balms contain. Vitamin E added for extra benefit! Peppermint Paddy - A chocolate lover's lip balm is back! Enhanced with a hint of peppermint. One way to get a hit of chocolate without all the calories! NOTE: We've now include Ilippe Butter into this formula for extra nourishment. Note: Picture is a representation. I use lip balm all the time, I always have lots of it around. This lip balm is better than burts bees and WAY better than chap stick. This is certainly the best thing I've used on my lips. I think that there is only so much that can be expected from chap stick or lip balm, and this product meets all expectations. It isn't overly minty, isn't overly greasy, or overly dry. It does exactly what you want it to. Definitely better that other beeswax type chap sticks.